Really trying to squeeze in every opportunity to wear a coat, even if it means going out after sun down. And let's make note of my uniform lately - black skinny jeans + pointy flat ankle boots + any combo up top. Gorgeous coat, so versatile and stylish! Same for me! I really need to invest in a new pair of skinny jeans but my uniform is pretty much identical. Except for my nike rosche runs on work days. nice!... 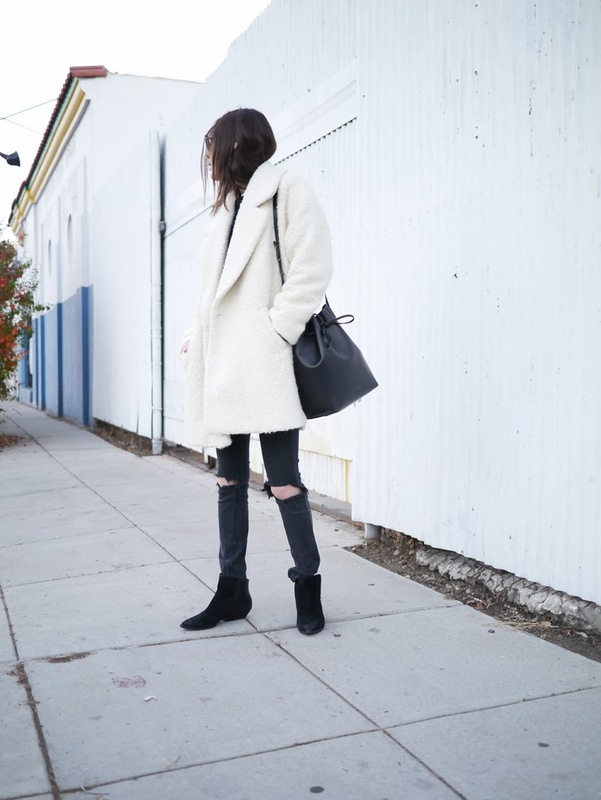 love the coat and boots!! so stylish. you make me wanna try out ripped skinnies! Ripped jeans are one of my favourite things at the moment and I adore that bag!! Very nice jeans with the cut-outs on the knees! I love ur coat.. so cool!!!!! i love your coat!i love your outfit! I am loving your coat! It would be a part of my winter outfit too.